Card is numbered # 7 of only 25 and is graded BGS 9 Mint with a 9 Autograph. 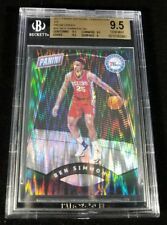 BEN SIMMONS 2016/17 PANINI PRIZM #1 RC ROOKIE 76ERS SP BGS 9.5 GEM MINT 10 Sub. Shipped with USPS First Class Package. BGS 9.5 (subs 9.5, 9.5, 9.5, 95) Joel Embiid 2016-17 Totally Certified #73 Green serial numbered 2/5. 2018-19 Panini Prizm Basketball- Landry Shamet RC Auto 01/10 (Gold) 10 PRISTINE . Condition is Like New. Shipped with USPS First Class Package. 2016-17 Ben Simmons Donruss Optic #151 BGS 9.5 Rookie RC TRUE GEM. Condition is Like New. Shipped with USPS First Class Package. 2018-19 Panini Prizm Rookie Signatures Landry Shamet Auto Rc Bgs 9.5. Condition is Brand New. Shipped with USPS First Class Package. Card: Prizms Starburst. Player: Ben Simmons RC. Graded: BGS 9.5 Gem Mint. Set: Prizm. YOU ARE BUYING A, 2018 IMPECCABLE HOBBY BASKETBALL, BEN SIMMONS STAINLESS STEEL, BRONZE, GOLD & SILVER HOLO RAINBOW PARALLEL LOT! SILVER HOLO PARALLEL #/25. SILVER PARALLEL #/49. GOLD PARALLEL #/35. BRONZE PARALLEL #/99. 2012-13 Panini Prizm Silver #205 JIMMY BUTLER 76’ers RC Rookie BGS 9.5 W/ 10 Sub. Shipped with USPS First Class Package for FREE. Jahlil Okafor 2015-16 Panini Prizm Rookie Autographs #1 BGS 9.5 Auto 9. Condition is Like New. Shipped with USPS First Class Package. 2016-17 Select BEN SIMMONS TRI-COLOR ROOKIE CARD # 141. BGS 9.5!! 2016-17 Select BEN SIMMONS TRI-COLOR ROOKIE CARD # 141. BGS 9.5!!. Condition is Very Good. Shipped with USPS First Class Package. BEN SIMMONS 2016-17 PANINI PRIZM BCCG 10 ROOKIE CARD #1 BGS! BEN SIMMONS 2016-17 PANINI PRIZM ROOKIE CARD #1! BECKETT GRADED 10! POP 1 likely rookie of the year Ben Simmons rookie Black Label. The legend Ben Simmons. His rookie card. _gsrx_vers_841 (GS 7.0.16 (841)). NO EXCEPTIONS! 2016-17 Panini Select BEN SIMMONS BLUE REFRACTOR PRIZM . Condition is Brand New. Shipped with USPS First Class Package. 2017-18 Panini Prizm Sensational Signatures #1 Markelle Fultz Rookie Auto BGS 9 Mint Z27351. - When buying multiple cards, do you top load each item?. If you wish to have all of your cards top loaded it is a paid service and can be arranged. 2017-18 Panini Impeccable - Charles Barkley - Philadelphia 76'ers - #IJCBK - Jersey Number Autograph card. This card has been professionally graded by Beckett Grading Services with a grade of BGS 9 MINT (Centering: 9 - Corners: 9 - Surface: 9 - Edges: 9.5). Simmons is Tearing up the League! Can he Lead the 76ers to an NBA Title?. Note on Factory Sealed Boxes and Cases and Graded Cards. We will NOT list a lower value or mark orders as gifts. Only card graded bgs 10. Eye popping card with pop 1. ROOKIE OF THE YEAR ?. The card is graded by BGS a pristine 10 condition. BGS 9 Allen Iverson 2015-2016 Totally Certified Signatures Mirror Gold serial numbered 09/10 auto graded 10. Dario Saric card no. 2. 2016-17 Panini Prizm Silver. Card is Beckett Graded 10. Up for sale is a 2014-15 Panini Select Joel Embiid Silver Prizm Rookie BGS 10 Pristine! Get it before it's gone! #114 Stud 76ers. BGS 10 Pristine. Corners 10. Surface 10. _gsrx_vers_841 (GS 7.0.16 (841)). Graded 9 MINT by Beckett Grading Services (BGS).